Vatican City — Taken at face value, it would be easy to presume that President Barack Obama and Pope Francis have a lot in common. After all, the two men have graced many of the same magazine covers, including Time, Rolling Stone, the Advocate and Fortune. They are both champions of social justice. And each has worked in the trenches — Francis in the barrios of Buenos Aires and Obama in inner-city Chicago — to help combat poverty. They are both well-known for their inspirational speeches and are both savvy when it comes to social networking, with Francis tweeting in nine languages to more than 10 million followers under his @pontifex handle and Obama regularly tweeting to 42-plus million followers. Each is so spontaneous and photogencic, there is even talk around Rome about whether the two will indulge in a playful selfie when they meet at the Vatican tomorrow. But for all the qualities the two powerful leaders share, it is their stark differences that might be most apparent when they meet. Francis might be the most charismatic pope in recent memory, but his talk of tolerance and inclusion has so far stopped short of any significant change beyond tone and atmospherics. He did spend his birthday with a group of homeless men and their stray dog, but he still hasn’t even come close to altering church doctrine on issues such as birth control, women’s equality or gay rights. There is also growing disparity between those who think Obama should view the pope as a policy man with whom the United States can work and those who think a presidential visit with the pope is more about symbolism and ceremony than substantive goals and shared objectives. Obama has much to gain from the historic meeting. (He is expected to engage the pontiff in a conversation about economic inequality, an issue he has emphasized in his second term.) But he will also have to tread carefully. While it might be tempting to try to harness some of pope's star power, it could prove to be a challenge for the president to do so without angering a number of his supporters. Francis will no doubt face the same scorn if he appears too cozy with the American president. 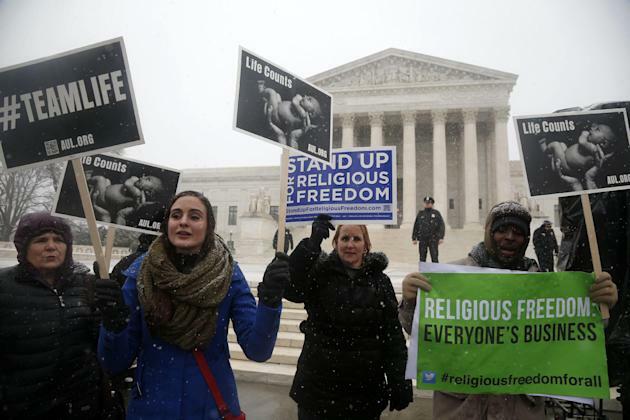 A reminder of just how divided they are came just two days before the president meets the pope, when the United States Supreme Court heard arguments on the validity of religious exemptions of the contraception mandate of Obamacare. Those exemptions, put forth by several privately owned businesses that don’t want to pay for their employees’ birth control on religious grounds, are supported by the U.S. Conference of Catholic Bishops, a powerful Vatican lobby with the pope’s ear. The divide remains deep over gay marriage as well. Pope Francis might have gotten a nod of approval from the Advocate magazine when he asked “Who am I to judge?” in response to a question about gay priests. But that in no way erases the reality that the pope sees marriage as a union between only a man and a woman, in stark contrast to President Obama’s personal views. “I think the president will say that we have principled differences on many issues, but let’s focus on where we find convergences,” Ken Hackett, the U.S. ambassador to the Holy See, told Religious News Service in Rome ahead of the state visit. Hackett, who was head of Catholic Relief Services, has been an instrumental intermediary between the Holy See and the United States on common issues such as poverty and social justice, and he says he is sure that those setting the agenda will keep the men off the hot-button topics. That was certainly the case when Secretary of State John Kerry visited his Vatican counterpart Pietro Parolin in early March. At a press conference after the meeting, Kerry said he was impressed by the new regime in Vatican City. “This was as comprehensive a conversation as I’ve had with any secretary of state or foreign minister in the course of my tenure, and I think, happily, we agreed on an enormous amount of things that we can cooperate on,” Kerry told reporters. O’Brien, whose group supports pro-abortion rights Catholics, has taken out a full-page ad in the International New York Times to run on Thursday with advice for Obama to consider before he meets the pope. “As your constituents, we want you to hear the echo of President Kennedy’s words as you meet him,” the ad reads. “Pope Francis’ interpretation of church teachings does not represent that of the majority of Catholics, especially on issues related to sexuality, reproductive health and family life. The Catholic hierarchy may be a powerful political lobby the world over, but when religious arguments are granted sway over policy, the results can be catastrophic. Other Catholics agree that the pope and the president should steer away from issues that divide them. James Martin, a popular American Jesuit priest and author of a number of books including New York Times best-seller "Jesus: A Pilgrimage," told Yahoo News he thinks Obama should try to guide the conversation to how they can join forces in trouble spots like Syria, Ukraine and the Central African Republic, where the Catholic Church has assets on the ground that could be used to find peaceful solutions to bloody conflicts. “Poverty, a focus of Pope Francis’s pontificate, will surely be, and should surely be, a focus of their meeting,” Martin told Yahoo News. "But Pope Francis and President Obama might also discuss ways of bringing reconciliation to trouble spots." He points out that the church has a sweeping global infrastructure, including “bishops, priests and lay workers in relief organizations,” that can be brought to bear on conflicts and disasters. “The pope brings a vast amount of grass-roots knowledge about the international scene.” There is speculation, for example, that the two could help foster a strategy on the Israeli-Palestinian peace process and pave the way for lifting the U.S. Cuban embargo. Martin also thinks that while the two men will differ on sensitive issues such as gay rights and abortion, there might be some wiggle room. “Clearly on abortion the two men will differ greatly, but perhaps some common ground could be found in the starting point of reducing the number of abortions,” he said. Many American nuns also believe the meeting between the two leaders could yield more than just a postcard from Rome for the president. Sister Carol Zinn, president of the Leadership Conference of Women Religious in the United States, which is an umbrella group representing more than 80 percent of American Catholic nuns, said the two men should cut to the chase right away. “I don’t want them to spend their time on surface issues. They should talk about the impact of the divide between the accumulation of wealth and the obscene abject poverty in the world,” Zinn told Yahoo News. She also believes they could help foster dialogue on some divisive issues. “They could offer sound guidance and inspiration to get people past the impasse on religious, cultural and sexual differences that so painfully divide people right now,” she said. Whatever they discuss, it will be seen as the most important meeting this pope has had so far as leader of the Catholic Church. Obama met Pope Benedict XVI in 2009, but meeting Francis, who shares his rock-star appeal, carries far more weight. According to the plans so far, the pope will first meet privately with the president for about a half-hour before aides, including Kerry and national security adviser Susan Rice, along with top diplomats from the Holy See join them for a more formal discussion. Security preparations were underway weeks in advance of the meeting, but Obama should not expect the red carpet treatment. Francis has shunned many of the extravagances of the papal title and, as such, he expects his guests to do the same, which means their meetings will be low-key with little fanfare. The American president will get more of a royal treatment when he meets Italian President Giorgio Napolitano at the Quirinale Palace and Italy’s new Prime Minister Matteo Renzi at the Chigi Palace. He is also expected to visit the ancient Roman Coliseum — a significant monument to Italy’s opposition to the death penalty — before retiring to the American ambassador’s residence for a private dinner. He travels from Rome to Saudi Arabia on Friday.